10 Must Have Printed Sundresses under $100! You all know how much I love printed dresses and tops (as seen here, here, and here), so today I've rounded up 10 of my top current picks for printed dresses, that are all under $100! Whether you're heading to a summer wedding, or out with your girlfriends for brunch, a cute and fun sundress is a great addition to add to your Spring/Summer wardrobe. It was actually super windy the day Chase and I shot these photos that when I was going through them all, half of them were me holding down my dress, so I wouldn't flash everyone walking by...(#bloggerproblems)! lol. Probably not the best dress to wear on a super windy day:p.
I hope you all are having a great week, and as always, thanks so much for stopping by and reading! I love the dress you're wearing! That print is so pretty and I really like the cut of the dress. Such a great option for spring and summer! All such great summer dresses! I love the one you've styled. What a cute dress! Love the pattern and the uneven hemline. That little boxy clutch is a beauty too! I love all your picks, and those sandals are to die for! I've been looking for something with a thicker heel that I can wear throughout the day, and those look like the perfect choice. Fingers crossed they're in my size! Thank you Angelina! Yes, u can definitely wear them all day and that's exactly why I love them. Not only do they look amazing, but they are super comfy:-). Hope u end up getting a pair! I love a good sundress. The hem and pattern on this is so fun. You are always so gorgeous!! Love your dress! Such a pretty pattern! You look lovely :) Also, beautiful photos! LOVEEE this dress and the print details. You look amazing girl. Can't wait to see more of your summer fashion. Beautiful girl in a beautiful dress! I haven't seen a bag like this, it's cute. You look beautiful as always and I love this sundress on you! Beautiful! Printed dresses are always so fun to wear. I adore the one you have on here! The print and colors are so pretty and unique. Haha, I knkw exactly what you mean with the wind! Marilyn moments for sure. I'll be either trying to keep my dress down or hair out of my face on windy days. Hope you havea great weekend! This dress looks gorgeous on you. Super in love with your dress! I absolutely LOVE that sundress! The print is gorgeous and I love the cut! Perfect for spring! Lovely pictures and I really love your picks! Gorgeous dress! Love the print and handkerchief hem! Wishing you a lovely weekend! I absolutely love this dress. You look absolutely beautiful! In love with all of these! Especially that J.O.A one for only $80!! Seriously might need to buy! And I loveee the dress you're wearing, though I TOTALLY feel you on the holding it down on a windy day thing! Ooops. I love the shape and pattern of your dress, so beautiful! I'm definitely going to have to check out the dresses you listed, looks like some great options. Oh wow, that is a stunning handkerchief dress and the prints on it is gorgeous! And haha, I can imagine how tough it is to make sure the wind don't flash you by mistake. Love the whole look but then again, I don't think it's possible for you to ever look bad. I love the asymmetric design and the way print is put together! lovely summer dress! This dress is gorgeous!! I need one!! So many sundresses under $100 but I love yours most of all! It's just so fun and flows so beautiful! I can tell it's windy, but that's my favourite part when wearing a dress! I love the print of your dress! I some cute sundresses in my wardrobe for summer! You look gorgeous! I love your selections and the one you are wearing as well :) Haha, the wind is always messing with me too, especially my hair!! Oh gosh you poor thing holding your dress down!! Wind during shoots is the worst! My boyfriend always laughs at me too, Im not sure if Chase is as harsh :P hahaah!!!! Nonetheless, you have seriously rocked it on these photos and its given you a nice hair-in-the-fan effect! P.S. I bet you totally DO suit hats! I can imagine you rocking anything! Your dress is gorgeous!! That is too funny about the wind! And I love all of your picks, especially the first one. Beautiful!! I love the dress!! Hello, gorgeous! Seriously love this post and your picks are amazing! Love the dress! I've been meaning to go to Lord & Taylor to look at their selection. Love some spring shopping! Ela, You look summer party ready -Gorg! 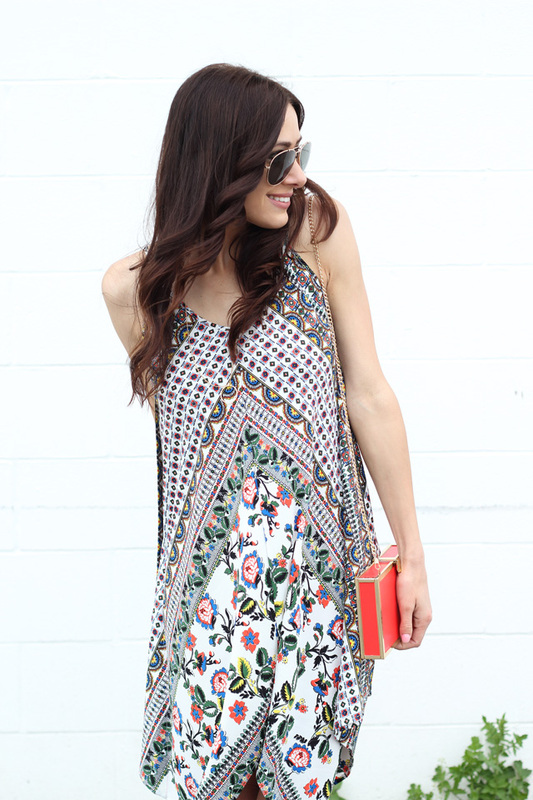 Such a pretty summer dress, lady- digging that gorgeous print! Such a pretty dress! Looks so beautiful! This dress is so gorgeous! I love it!!! You look so pretty! Love all of the other ones too! Nice finds love the selections, I also love the dress you are wearing nice print. you look great. You look so beautiful in this summer boho dress. I love your red box bag too!